This doesn't look much like a galaxy, but it is in fact the Large Magellanic Cloud, one of the biggest satellite galaxies of our Milky Way. This awesome infrared image reveals the real look of this galaxy like never before. The dust temperatures tend to trace star forming activity. Spitzer data in blue hues indicate warm dust heated by young stars. Herschel's instruments contributed the image data shown in red and green, revealing dust emission from cooler and intermediate regions where star formation is just beginning or has stopped. 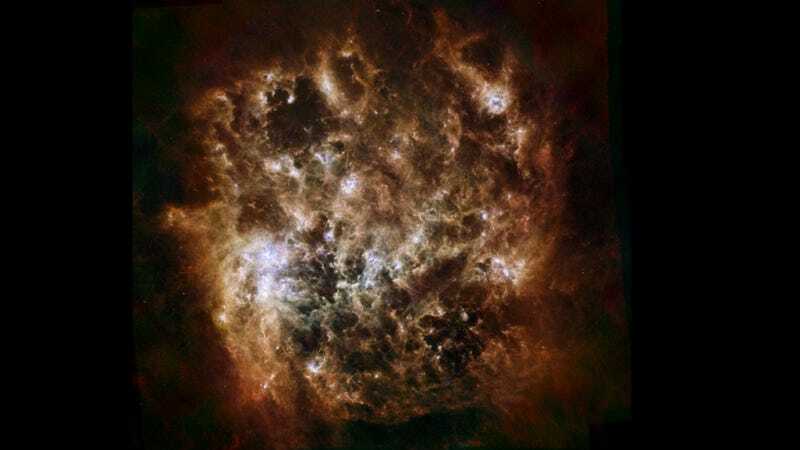 Dominated by dust emission, the Large Magellanic Cloud's infrared appearance is different from views in optical images. But this galaxy's well-known Tarantula Nebula still stands out, easily seen here as the brightest region to the left of center.